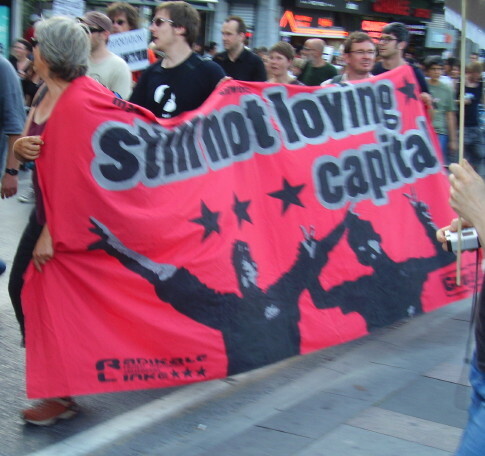 In many occasions in several thematic Assemblies, seminars and workshops (*) of this 6th ESF, a call has been sent to create a European massive popular mobilization against public debt and the causes of the crisis joining together political, union and association forces, at the national and European levels. In the name of the public debts, austerity plans generating the worst social regressions are imposed by the European leaders, European institutions and IMF. We must stop these unacceptable attacks against the people of Europe by adopting a unilateral moratorium (with no accumulation of interest) on debt reimbursement for the time required to make an audit of public loans (with citizen participation). On the basis of the results of the audit, any illegitimate debt will be cancelled. (*) “The debt crisis, North and South”, “What alternatives to IFI and Capitalism?”, “Anti-crisis programs of left and social movements: a comparative analysis”, “Ecological debt, responsibilities of financial institutions and solidarity solutions”, “Crisis, Nationalisms and Fundamentalisms in Eastern Europe and the answer of the Feminist movement”, “Finally we are all PIGS? (Europe in crisis)” and in the Final Assembly on Labour.